... no savvy heart disease researcher can read these historical observations without raising a standard and reasonable objection, namely, that the meat from today’s domesticated animals is far more fatty— and a greater proportion of that fat is saturated— than was the meat from wild animals roaming around a hundred years ago. Experts argue that the meat from wild animals contained a higher proportion of polyunsaturated fats, which are the type found in vegetable oils and fish. IV If wild animals contained less saturated fat, the argument goes, then early carnivorous populations would have consumed less of this fat than people eating meat from domesticated animals today. Let's pause to object to the use of the term carnivorous. Most human cultures, even tribes who based their diets on buffalo, were not carnivores. Humans have been, and always will be, highly adaptable omnivores who will eat an all animal diet only if forced to by the environment. Even then, as soon as contact is made with other cultures, this funny thing called trade always seems to happen to both bring variety and alleviate periods of extreme scarcity -- e.g. starvation. Ahh yes. Those who counsel eating less animal food/fat as a means to lower saturated fats are oversimplifying things. Those unscientific fools are trying to mislead you because Large Lardo didn't have the money to wine and dine folks like Big Olive did. She, on the other hand, will take any shortcut she needs for brevity. That's allowed you see. And yet, as she fails to achieve brevity, she uses the simplification to distort facts over, and over, and over ... throughout the book. Realize that the end of her Introduction includes a chart of fat sources (incomplete -- missing some obvious sources such as nuts and avocados -- and inaccurate -- canola is over 60% MUFA, ~20% O6, ~10% O3 PUFA but she lists it under O6 PUFA while MUFA source lard is less than 50% MUFA) before she launches into a listing of populations whom she claims eat mostly meat (listed on that chart under saturated fat). The reader is reminded these are saturated with the Masai. There is no mention that the fat the Inuit ate is highly UNsaturated. But ... Now Teicholz is going to set the record straight on this wild animal are full of PUFA nonsense! You see, all of those *others* who cite Crawford in lock step following the mainstream line are doing just that ... blindly going along with the crowd. And now for the main act in the center ring, Nina Teicholz will distort the work of yet another scientist while besmirching his character with her innuendo. It's quite an act!! 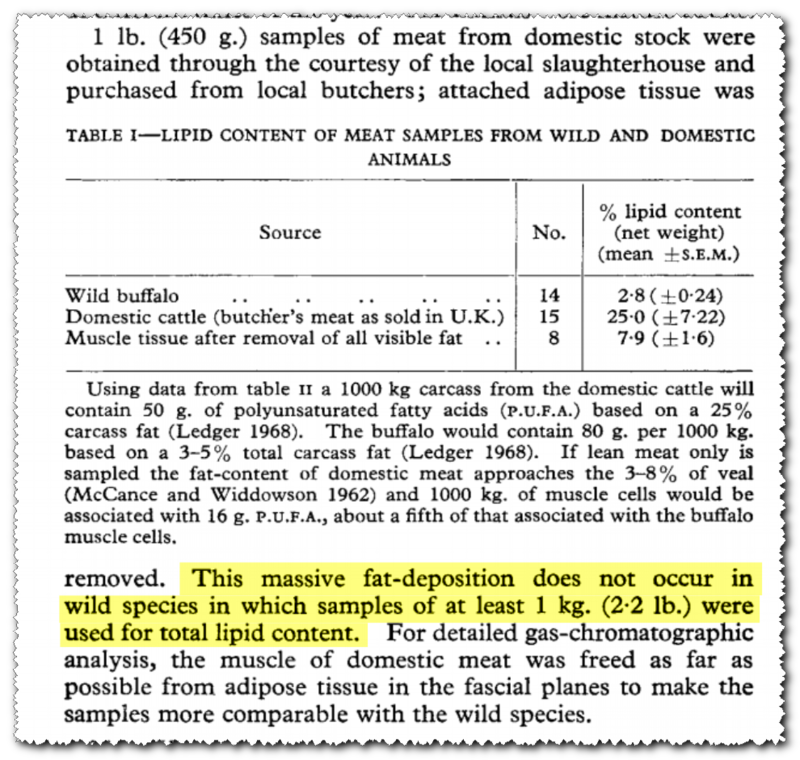 What Crawford buries in his data, however, is that the saturated fat content of the wild and domesticated animal meats hardly differed at all. In other words, the factor that was supposedly dangerous in red meat was no higher in the English cows and pigs than it was in Uganda’s beasts. It is interesting to note that the "parks" buffalo were essentially "grassfed". While the pre-pop-era paleo line was one emphasizing the overall PUFA content of wild meats vs. domestic, it is important to understand that "grassfed" is at best the equivalent of the "parks" buffalo above. Note that true wild buffalo (woodland) contain three times as much PUFA compared to even the "parks" variety. While much closer than domestic, it is still a considerable difference. Before moving on, a little check of the math here. Elsewhere in the book, Teicholz insists that Americans have reduced dietary fat intake since the 1970's because fat used to comprise 43% of calories and now comprises 33%. Leaving aside for a moment that this is a lie based on Teicholz's source for these values, those numbers have been further percentaged to claim a 25% reduction in fat intake. Any way you look at it, though, percentages are a slice of a pie (cauliflower crusted stevia sweetened cow pie) and when one goes up, the other must go down and vice versa. Since we're talking about different types of fat making up the whole here, as demonstrated in Table II above, when PUFA content is increased in proportion, the combined MUFA+SaFA content must be reduced. As you can see, per 100 grams of meat, you're getting almost 25 grams combined of saturated and monounsaturated fat, while you get only 2 grams from the buffalo. 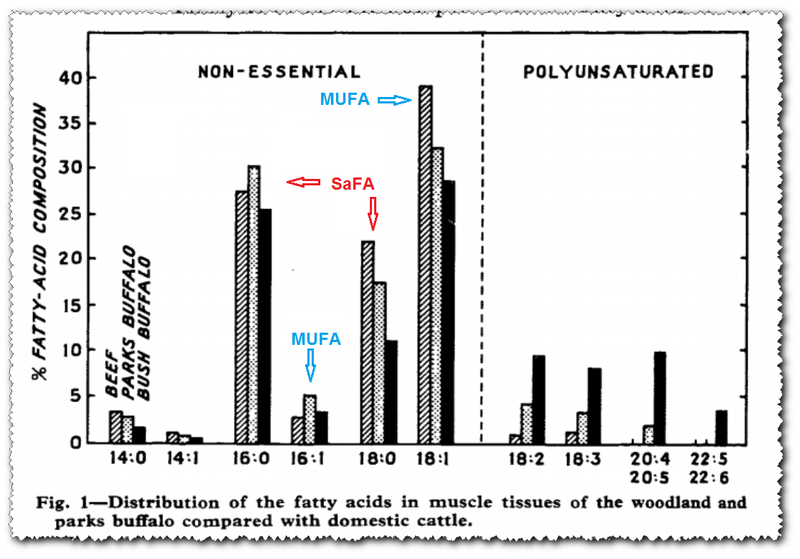 Even IF the ratios of SaFA to MUFA differ wildly, there is almost no mathematical way to support the contention that saturated fat did not differ. If 100% -- all 2 grams -- of the combined amount is saturated in the wild buffalo, then the domestic cattle would have to contain 22.7 grams of MUFA, a value that would put MUFA:SFA ratio at 9:1 which is not in keeping with what we know about ruminant fats. Rather, Crawford's data supports the statement that domestic beef contains more than 10 times the saturated fat of wild buffalo. Instead, the domesticated animals turned out to be higher in monounsaturated fats, which is the kind found predominantly in olive oil. So whatever the differences between wild and domesticated animal meat, saturated fat was not the issue. I'm adding this much emphasis here to accentuate just how brazen a lie this is. Below is Figure 1 from Crawford, with some labeling added by me. Yes, the oleic acid (18:1 MUFA) content of domestic beef is considerably higher than that of the wild buffalo ... roughly 10% of total fat content higher. But both the total MUFA and the total SaFA contents are higher in the domestic beef. So I put this information together with the table I previously conducted from Tables I and II (I adjusted the totals to Crawford's percents though the 98.8 is likely a typo, it's inconsequential). While domestic cattle contains more SaFA and MUFA compared with wild buffalo, this is due to lower PUFA content. 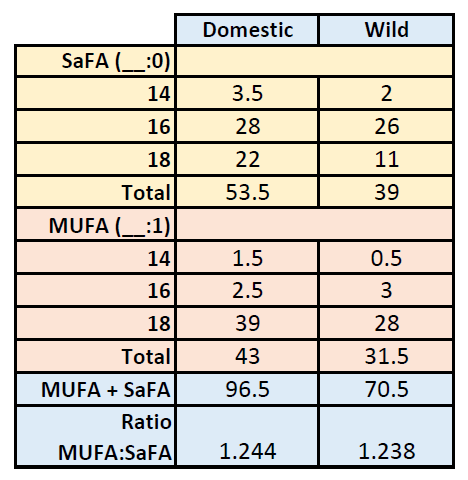 The ratio between SaFA and MUFA in domestic vs. wild meat appears to be virtually unchanged. While the PUFA:SaFA:MUFA percents for wild buffalo can be loosely rounded to 30:40:30, the pattern is dramatically different in domestic beef which is virtually devoid of PUFA and the ratios could be loosely rounded to 0:55:45. The fatty acid distribution taken together with the overall fat content of domestic beef is 14% by weight for domestic beef and only a smidge over 1% by weight for wild buffalo. Where did Teicholz get her statements? Not from the Crawford paper. Rather they were POOPed out. At some point, this woman needs to be held to account for her gross mischaracterizations of her often difficult-to-obtain sources. There was nothing hidden in Crawford's data, though as you can see through my analysis here, some of the comparisons needed to be teased out by presenting the same data in different formats. None of this supports Teicholz's assertions. Quite the opposite. THE amount and type of dietary fat may be related to atheroma (Ahrens et al. 1958, Funch et al. 1960). Death from arterial disease is correlated with a high intake of animal fat, protein, and calories (Yerushalmy and Hilleboe 1957) and it is likely that the animal fats and the calories are more relevant than the protein (Katz et al. 1958, Keys 1963). That the nature of the fat may be important is suggested by the fact that polyunsaturated fatty acids can protect the artery from damage in experimental situations (Thomas and Hartroft 1959, O’Neal et al. 1959, Wissler et al. 1962, Moore and Kon 1963, Kim et al. 1965). The work on experimental atheroma tends to implicate, in some way, animal fat or carbohydrate (Sandler and Bourne 1963, Roberts and Strauss 1965). In this context, I have previously asked if, by examining data from a prosperous Western community, we may be dealing with an abnormal state (Crawford 1964, 1967). I may have mentioned that I went to her book talk for this book, and I mentioned that although the percentage of carbs went up, in absolute terms everything went up, maybe just not as quickly, and she really looked at me blankly. I don't think she understands the difference. I no longer expect anyone to understand math, people can hardly make change, forget percentages, orders, interest. Solid gold, Evelyn!! I assume this is the whopper you were talking about? Curious: Is this recycled Gary Taubes falsification from GCBC or purely original Teicholz's mangling of the facts?? She's telling people compelling falsehoods in order to influence their dietary choices in ways which may adversely affect the health of many. It's her JOB to get the facts, as well as the math, straight, doggone it !!! This book reeks of AGENDA! I don't think I'll ever read her book now. I was hoping to find a history of the low-fat nutritional recommendations and the subsequent low-fat diet fad that would be less tendentious then what came before. It's weird this stuff is endorsed by the Economist, she gets favorable coverage in Medscape, BMJ, WSJ, and an OP-ED in the NYT. I lost weight by eating lots of bacon and cream. Here's a scientific explanation for why. He didn't win me over when he linked Teicholz's WSJ piece first thing, but I was willing to give him the benefit of the doubt. But he just kept getting worse, attacking Ancel Keys, observational studies, finally linking to Mark Sisson. Et tu Vox.com? Anyway, Vox accepts story tips and SBM might accept submissions. Maybe with Evelyn, Seth, and others advising we could get something on more sites like this to challenge the revisionist version of history? "Fun fact: Wild buffalo contains more PUFA than canola oil"
Ehm, you probably meant "wild buffalo FAT". Otherwise it doesn't make any sense. But, but, but... didn't you know that canola oil is made from toxic RAPEseed genetically modified by the Devil himself (right after creating the frankenwheat) as the most recent move in his grand plan to permanently expel mankind from its former Paleo Paradise? How dare you to compare God's most wholesome food, the very source of the Indians' good health and immortality, to the Devil's oily excrement? distort facts over, and over, and over ... throughout the book." Distort facts? How does that work? A fact is always true. However, truth itself can be distorted by selecting and organizing factual information. Perhaps you meant to say that Teicholz distorted the opinions of the likes of Prentice and Crawford. Distorts the facts in her presentation of them. IOW, presents distortions of the real facts as her own facts. I'm not going to get into a debate about my writing style here. This is a blog. Crawford's chemical analyses are FACTS David. Teicholz distorted what his facts were with her biased opinions. Or, more likely, those of someone else. I'll address your first and last comments. Your quote: "Death from arterial disease is correlated with a high intake of animal fat, protein, and calories and it is likely that the animal fats and the calories are more relevant than the protein." The problem you are having with being taken seriously by those you contact in the hopes of getting your ideas out there may be encapsulated in the above. The whole purpose of the beleaguered Seven Countries study was to investigate this further, along with studies of all sorts too numerous to list. Markers in Postmenopausal Women with Diabetes. Of course there was significant dietary under-reporting that pretty much nullifies all of the diet/circulating relationships. As discussed in the thesis, but you neglected to mention. Funny how the non-HDL or TC/HDL ratios are identified as significant biomarkers. When one watches her TEDx talk and her media appearances, it becomes clear that she's been very well coached since, or has some background in public speaking and the like that had gone rusty, was dusted off and polished up post haste. Again, "real facts" is redundant, like saying "true facts." And I'm not talking about your writing style. We're all capable of being sloppy in terms of choosing information as well as careless in our use of words. That has nothing to do with writing style. What you do here is of great value because you point out the sloppy thinking and careless (Let's pause to object to the use of the term carnivorous.) use of words. I'm just trying to do for you what you 've been doing for Teicholz. With that in mind, a belief is whatever a person chooses to accept as true. As you know, it is foolish to embrace an opinion without familiarizing oneself with the facts upon which opinion is based. However, when new facts come to light, it makes sense to abandon the opinion if it does not adequately explain the phenomenon under investigation. Case in point is the connection between dietary fatty acid intake and plasma fatty acid profile. Depending on the type of digestive system, the microbiota profile, the micronutrient profile, fiber content, and the macro-nutrient percentages, fatty acids in food may appear in the plasma, be converted to another form, be incorporated into the cell membranes of the microbes inhabiting the digestive tract, or they may be excreted intact. I could be mistaken but those who comment on this blog don't seem to have given these matters much study or thought. Thank you again for the semantics lesson. I didn't claim carelessness, simply that anything written in a blog post is not by nature of the venue subject to the same scrutiny as those written in a book of the nature of BFS. Teicholz calls herself a carnivore on Twitter so take that up with her. If you want to do for me what I am doing for Teicholz, you are failing miserably by focusing on phraseology rather than what I am saying. Don't give me the new facts come to light angle here. We are talking about the OLD facts upon which Teicholz lays out a "new" argument. Crawford's results (the fatty acid analyses) are fact. Teicholz's discussion in the book would lead one to believe that these facts were indeed different than they objectively are. So I used the phrase "distorts the facts" as in she misrepresents what those facts are. Please refrain from guessing what anyone who reads or comments here is thinking. It's rude. It also has NOTHING to do with the topic of this post, which is the adipose tissue content of various fatty acids in wild vs. domesticated versions of similar animals that can be attributed to diet. 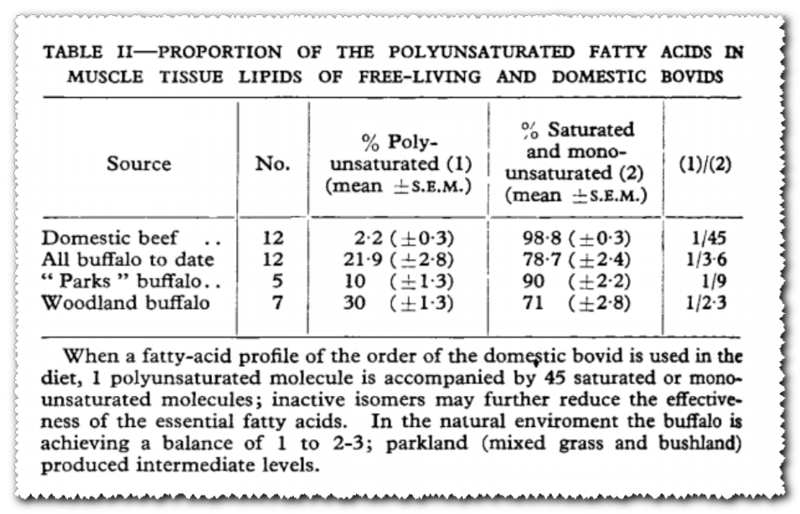 The human body doesn't care why wild buffalo have higher PUFA, only that they do. about the OLD facts upon which Teicholz lays out a "new" argument. Point taken. Teicholz made some careless mistakes which you have pointed out to her. Good job on that. However, if you are truly concerned about improving our collective understanding of how the real world works, I suggest you incorporate the NEW facts into your thinking. I didn't mean to insult anyone. I said, "I could be mistaken but those who comment on this blog don't seem to have given these matters much study or thought." I thought I was issuing a challenge to prove me wrong. Thus far there's been little interest in refuting my opinions. Yes, of course they want to salvage their grant funded work. It's human. But that degree of error in reporting brings ALL correlations into enough question as to nullify them. Teicholz's "mistakes" are not careless. One could presume so on a benefit-of-doubt basis, but her "correction" on the buffalo eating Native Americans of the Southwest would unequivocally demonstrate otherwise. Are you defending her here? Or claiming any sort of parallels to my analyses with hers? Omg, that means all these vegan mothers in Tamil Nadu having over hundreds of generations brainless babys? Or does it mean that hundreds or thousends of western scientists having some limitations in the brains that they dont see the 800 pound gorilla in the room? I read the paper where they discussed the error in underreporting. Did you? Which paper? The Masters Thesis by Nancy Carol Baker or some other paper about reporting errors. I have to laugh at the "quietly replacing" nonsense. The "high oleic" has been around for a very long time and it's to parallel the fatty acids in olive oil. This is something I have wondered about looking at bottles on the store shelves. Safflower oil supposedly has the highest n-6 PUFA, but the product label in stores is pretty much entirely MUFA. The only one's that I could find that are high in PUFA are grape seed oil and walnut oil, and soybean oil which is usually labeled vegetable oil has some combination. I suspect that so few have high PUFA has to do with cooking properties of MUFA or the tendency of PUFA to become rancid. I think it probably seems so quiet because the average consumer has little knowledge beyond poly, mono, and omega-3. I don't believe I've failed to consider anything or have any interest in proving you wrong. Maybe it's because I came upon the conversation in the middle or because I have never taken a class in biochemistry, but to be honest, I don't find your comment to be expressed in a way that is easily understandable. I see citations of studies and suggestions to google this and google that without explanation of the relevance. I just don't think you are connecting the dots very well here. With biohydrogenation, it's interesting, but I don't see anything to express a problem for dietary LA in the study. It was ex-vivo so it's hard to know if it would be even be applicable in vivo. Also, I think I pointed out before that a small percent of LA would make it to the colon anyway. By the way, what technical help and expertise did you provide the authors of the biohydrogenation study? Lastly, I've had a Google Alert in place for "Omega-6 linoleic acid" these past five years. Had the high oleic acid oils been publicized with any mention of linoleic acid, I would have gotten wind of it. Glad you had a laugh. Laughing is healthy. What's your thinking concerning the arguments of these two characters? Sorry to see there's no longer any leeway for a side-excursion on the CarbSane Highway. Arachidonic acid generally gets a bad rap. In my opinion, to achieve optimal nutrition, the issues are appropriateness, adequacy and toxicity. Adequacy: In order for chemical reactions to proceed to completion there must be sufficient amounts of all the required chemical reactants. Mineral imbalances and deficiencies can be avoided if the food is mineral-rich. Refined sugars and grains are not mineral-rich. Perhaps that's why Americans spend 10s of billions on supplements annually with hopes of furnishing enough vitamins and minerals to ward off disease. Toxicity: Supplementation and even really good quality, mineral-rich food cannot totally mitigate the toxic effects of a highly reactive molecule such as linoleic acid. However, a diet that promotes the proliferation of bacteria that biohydrogenate linoleic acid to other species of fatty acid more benign than linoleic acid may make it possible to consume rather large amounts of linoleic acid for quite a while without apparent harm. If a person's linoleic acid intake is very low and his mineral intake is adequate, a reasonably high sugar intake will likely be well tolerated. As I understand it, however, releasing energy derived from carbohydrate uses up more mineral resources than does releasing energy from fats. In other words, separated fats such as butter do less to deplete minerals stored in cellular reserves than refined carbohydrates such as sugar. A person can learn a lot from both Ray and Peter. Hey David,—thanks for replying. And thanks for more links to check out. You said: " a person can learn a lot from both Ray and Peter." The websites I frequent are the ones I have in fact benefitted from; I've learned things of value to me from bloggers and commenters having diametrically opposed views on choiceworthy diets. You mentioned: "...the toxic effects of a highly reactive molecule such as linoleic acid." As I understand it, both Omegas—the 6's and the 3's—are indeed highly reactive molecules; Omega 6 is the one most often regarded as dangerous for just this reason, but Omega 3's are reputedly even more highly reactive, yet are routinely recommended,—either to "balance" the omega 6 in one's diet, or for their own purported beneficial value (Peat is the only guy I can think of whose advice is to generally minimize both; even Peter D joins his polar opposite Dean Ornish in knocking back fish-oil capsules). So the question looks to be about how best to reconcile these two factors,—namely the [purported?] danger of taking in highly reactive substances,—but substances which are nevertheless required: the indisputable essentiality of glucose and the [purported?] essentiality of the Omegas. Hence the perennial questions: How much per day? How much per meal? Recently, Verner Wheelock suggested Gary Fettke's blog at http://www.nofructose.com/introduction/ Previous to this, I had not heard of Fettke. I'm finding his commentaries interesting. "Something has happened to our dietary intake in the last 100 years or so to account for the massive shifts in diseases experienced by modern society. Fructose and Polyunsaturated Oils look to be the major contributors to most of our Modern diseases including obesity, diabetes, heart disease, dementia, cancer and a raft of other conditions." David, you have just shot yourself in the foot. Again. "I frequently write to authorities who bash saturated fats. Below is a response to a message I sent explaining why I don't buy the cholesterol hypothesis." David, I'm curious to know who is behind that response. In my second email to the person quoted, I asked for permission to quote his response with attribution. I'll get back to you on that if permission is granted. I'll include the article that brought that individual to my attention. a. If—as the common view has it—low density lipoprotein cholesterol (LDL-C) invades the coronary artery wall from the coronary lumen, then the initial depositions ought to be most proximal to blood, i.e., in the inner part of the artery wall. The facts show that the opposite is true, and lipids are initially deposited in the outer layer. The normal artery wall is avascular, receiving nutrients by diffusion from the lumen, whereas in coronary atherosclerosis (CA) the outer part of the artery wall is ALWAYS neovascularized. b. small as they are, the LDL-C particle size—at 20 X 10⁻⁹m—i.e., 20 nm!—is too large to pass from the inner to the outer part of the artery wall by diffusion. But once the normally avascular outer layer has been neovascularized, LDL-C can now enter the wall via this new (and abnormal) blood supply route into the artery wall. These facts are what now come to mind each time I see another instance of the phrase: "artery-clogging saturated fats. That paper is very interesting indeed. Where is Nigel, do you know? I wish he'd come back. Dunno, Jane...I hope that karaoke hasn't taken over his life! I've been reading the paper with minimal comprehension. My maternal grandfather used to say that Latin and typing are courses every high school student ought to take. I can see the wisdom of that advice. I taught myself to type about 20 years ago using a computer program. Now I'm having to learn some Latin terms to understand this paper. It's interesting that the Subbotin paper (2012) has been cited by only one other paper (2014). http://www.ncbi.nlm.nih.gov/pmc/articles/PMC4309857/ I'm going to be studying that one as well. Billy, what led you to the Subbotin paper? Was it an article? I would like to read that as well. Thanks for inserting this into the discussion. Q. Why does the outer layer of the artery wall become neovascularized in the first place? "...the cells in the coronary tunica intima respond by proliferating to any stimuli, exogenous or endogenous. Regardless of the nature and magnitude of stimuli/ insults, cells that appear in the arterial intimal compartment always proliferate in response. An increase in cell numbers inevitably expands intimal thickness, which occurs with aging [119,181]. Expanded intimal thickness impairs diffusion of oxygen, as diffusion is inversely proportional to the square of the distance. Insufficient oxygen diffusion would inevitably result in hypoxia, specifically of cells in the outer layer of the artery wall (DIT), because this tissue compartment is the most distant from the lumen and adventitial vasa vasorum...[and] when the intima of the coronary artery exceeds a certain thickness, parts must either die or develop secondary blood supply: i.e., neovascularization. "Calcium deficiency is a constant menace to land-abiding animals, including mammals. Humans enjoying exceptional longevity on earth are especially susceptible to calcium deficiency in old age. Low calcium and vitamin D intake, short solar exposure, decreased intestinal absorption, and falling renal function with insufficient 1,25(OH)2 vitamin D biosynthesis all contribute to calcium deficiency, secondary hyperparathyroidism, bone loss and possibly calcium shift from the bone to soft tissue, and from the extracellular to the intracellular compartment, blunting the sharp concentration gap between these compartments. The consequences of calcium deficiency might thus include not only osteoporosis, but also arteriosclerosis and hypertension due to the increase of calcium in the vascular wall, amyotrophic lateral sclerosis and senile dementia due to calcium deposition in the central nervous system, and a decrease in cellular function, because of blunting of the difference in extracellular-intracellular calcium, leading to diabetes mellitus, immune deficiency and others (Fig. 6). It's a primary reason why I follow the great pioneering nutritionist Elmer McCollum's 100 year old recommendation for everyone—including adults—to have one quart of milk per day. "However, heart attack involving unstable plaque may be more related to excessive linoleic acid intake than calcium deficiency." The paper cited (from AHA's Circulation: Cardiovascular Genetics) in support of the statement above provides an analysis of the lipid composition present in human lesions, and just as you say, linoleic acid is seen to be selectively enriched in cholesterol ester (CE) species, but it doesn't follow from this that the problem was therefore one of linoleic acid intake. The examined plaques were selectively enriched not just in linoleic acid, but also in oleic acid, and if dietary intake per se was responsible for it getting there then Walter Willett and all the other Mediterranean Dieters would have to stop glugging their beloved—and purportedly heart-healthy—Extra Virgin Olive Oil. There's lots of stuff that ends up being in atherosclerotic plaques: the analysis (in that same paper) "...revealed 24 (of a total of 150) distinct lipid species that were differentially identified in the atherosclerotic plaques." The key question remains: Not: What ends up being inside the plaques? but What is the initiating event that starts the atherosclerosis process in the first place? Calcium is also present in plaques, but it surely doesn't get there as a result of dietary intake, and reducing one's intake to zero will not guarantee the absence of calcium in plaques (indeed, I am persuaded the opposite is the case!). Likewise, despite the well known and well publicized pro-inflammatory problems of linoleic acid—and its presence in atherosclerotic plaques—I don't think the evidence to date warrants avoiding the use of Hellman's mayo on my occasional tuna salads. Or using olive oil on tossed salads. Ω-6LA is, after all, an essential fatty acid. Since David Brown does enjoy "two to three pounds of butter a week"—(a bit more, but not that much more, than yours truly)—I'm pretty sure that you're thereby already getting your RDA for Ω-6LA. Perhaps I didn't make it clear. Linoleic acid makes the plaques unstable due to it's toxic effects. Oleic acid, even though selectively enriched in plaques, does not make them unstable. Even the Masai have atheromas but they don't have heart attacks. Why? Willett would say that enlarged coronary arteries due to constant exercise it the answer. I'd say it is the low linoleic acid content of the Masai diet. Note that circulating oleic and linoleic acids are not necessarily related to dietary intakes due to biohydrogenation and de novo lipogeneis (DNL). "... the facts are that it is clear from 50 years of data now, that saturated fat puts up cholesterol which is a major cause of atheroma and there is no doubting that. Whether some other factors influence it to some extent or not is really what the debate is about, not whether sugar is uniquely damaging, for which there is little evidence, or that fat is. We need to have a balanced approach to this. We need to reduce both trans fats, saturated fat, total fat intake and sugar intake to deal with the obesity and type 2 diabetes crisis and the atheroma that is the third cause of death in the world – and reduce salt which is the main factor putting up our blood pressure which is the biggest cause of death, even greater than tobacco. There can be no disagreement about this. There are slight nuances between some factions and others are rather desperate and they don’t help the overall message which is to stop the food industry slowly killing us and to get more healthy food from them so we can live longer and suffer less from strokes, heart attacks and heart failure." Thanks David, some strong words from MacGregor in those replies, though they are easy to refute. I hadn't seen that review. Thanks ZM. I requested the full text article. I just looked up this MacGregor person. He's a big shot professor with 400 publications to his name. Doesn't stop him from being a complete idiot. Salt is the main factor in hypertension? What about magnesium? Sodium isn't the problem, it's the sodium-potassium balance, which is controlled by magnesium. Surely MacGregor knows that both magnesium and potassium are in short supply in the modern diet due to something awfully simple: they get deliberately removed from refined carbs. The sad thing is, it is thought leaders of this sort that shape public nutrition policy, not people like yourself who are familiar with the science. Using EasyHits4U you can earn free advertising credits by viewing other ads from a account base of over 1.2 million accounts. Earn advertising credits faster with a 1:1 exchange ratio.